Prosciutto-Wrapped Melon Bites with Lime Drizzle | What's for Dinner? Wife, mom, realtor, lover of red wine and all things dark chocolate! Enjoying life one meal at a time! Posted on March 30, 2010 by What's For Dinner? We do a lot of entertaining at our home, and I’m always on the lookout for good appetizers. This one is great for summer when the melons are at their peak! My friend, Blanca, found it in a Cooking Light magazine, and when she made it for me, I knew it was a keeper! I could have eaten the whole dish as a meal! I really like the flavors of the prosciutto and the melon together. The lime drizzle with the red pepper and the fresh mint creates a really refreshing dish! Instead of threading on skewers, I just wrapped them up and secured with a toothpick. 1. 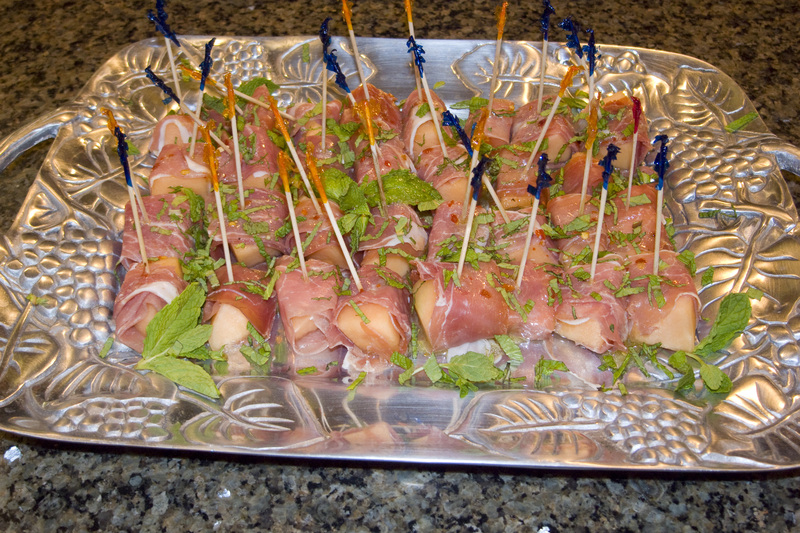 Wrap each cantaloupe cube and each honeydew cube with 1/2 prosciutto slice. Arrange skewers on a serving platter. 2. Combine juice, oil, and pepper, stirring with a whisk; drizzle evenly over skewers. Sprinkle evenly with mint.